From a conceptual standpoint this is the digital version of the old digital cork board that you had in your room or office where you pinned articles, images or things that interest you. The description is added to describe what each one of your boards contains. Pinterest is a very visual social networking site and as you can see by my boards how it might be used. This social networking site has a different flair to it and has grown into one of the more popular sites. Maybe it is because a picture is worth a thousand words. Caution: you can waste hours looking through all the images pertaining to your interests. 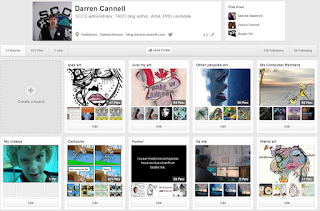 Create an account on pinterest.